New Recipe, and Some Flowers! I did Day 3 Level 1 of the shred today. It’s getting a little easier. I’m really hoping I can go through it without pausing by day 10. I want to keep up the working out daily, which is a little rough when I’m coming home after midnight, but I do sleep well after that! haha. Spring really just feels like a time of change. I need a little change for the better again. I’m vain, I won’t deny that. I want to look hot on my wedding day! I want me future children to think their mom was pretty when she was young, and I know I sound silly, but that’s just it. I’ve also been very good about what I eat! I’ve been having 4 – 5 smaller meals every day rather than 3 big meals and lots of snacks in between. I also haven’t eaten anything I didn’t personally make, so I know exactly what I’m eating and every evil calorie is accounted for. It hasn’t even really been that bad. I’ve said before I’ve tried all the “diets”, but really this whole portion control thing is working out better for me than anything else has. I even stumbled across a new recipe that I am completely and utterly in love with, and am eating for dinner right now! 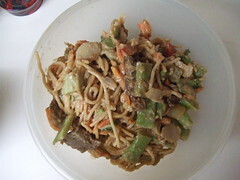 I call it Peanut Ginger Stir Fry and it is amazing. I really had every intention of making a huge thing of stir fry for my dinners for at work, but at some point during the cooking process I remembered seeing a recipe for peanut butter glazed chicken and randomly decided to add peanut butter to the stir fry, soooo here it is! 1 cube chicken bouillon, in 1 cup water. Marinade the meat in a mixture of the Worcestershire sauce, rice vinegar, and Asian sesame dressing for an hour or so, or while you’re waiting for your linguine to cook, which I hope you don’t need instructions on boiling noodles 😉 Then in a big skillet, preferably the biggest you have, heat up about a cup of the Asian sesame dressing. Drain the dressing the meat was marinading in and add the meat, onions, and garlic and stir fry until the onion gets cooked through. Add the rest of your thawed veggies and cook those through. Then add the pseudo chicken stock and make sure your only using about medium high heat as you add the peanut butter. Now this is where it gets kid of tricky. Peanut butter does not like to cooperate! It’s hard to work with and you need to melt it down with the heat from the other ingredients. Problem is if it’s too hot the peanut butter sticks to the skillet and you have an awful mess and burnt crap, if it’s not hot enough the peanut butter stays in a big clump. Just be careful here. If you think it’s a little too thick feel free to add some more water and then add the noodles. Throw a few splashes of soy sauce and then a VERY LITTLE bit of ground ginger. Ginger can be very over powering, so unless you were really going more for the ginger flavor over the peanut butter, be careful. And that’s it! It’s about 250 calories for one cup, if I did my math right (which you really shouldn’t trust my math, but that’s what I’m tracking calorie-wise) So it’s seriously my new favorite dinner. The peanut butter is a great food for keeping you feeling full, and it’s just good. I really can’t say enough about it, but again, I like really weird food combinations. Anyway, there’s something else I’d like to share, my wedding bouquet! This is what I’ll be holding when I walk down the isle! I’m actually really excited about this, because it’s something that I actually pictured and made a reality. I was a little concerned I wasn’t going to be able to pull off the kind of bouquet I wanted, but I did! I think the second picture does the flowers a little more justice. 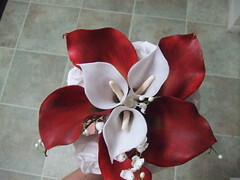 I also cannot believe how hard it is to find red calla lilies! Seriously, I think I checked three different Pat Catan’s and Michael’s before I finally found some available online. They were really expensive, so I went back to Pat Catan’s one more time and found exactly as many as I needed. I couldn’t believe my luck! So now basically it’s down to stocking up on all the stuff we’re going to need for center pieces and the rest of the bridesmaid flowers. 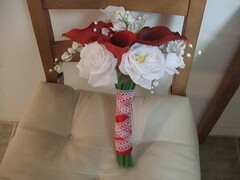 I decided to make theirs just white versions of mine with the white calla’s and maybe carnations instead of the roses. I’ll cross that bridge another day! Tomorrow is thankfully Friday! Saturday Justin and I are heading to Pittsburgh to have a double date with Bree and Vince at the water front and grab dinner. I’m just ready for the weekend, it’s time for fun!